Click HERE to watch KTLA Coverage of the day. Click HERE to read Los Angeles Times coverage. With chambers at standing room only, the CCFO died in Council today – Council Member Mitch Englander simply did not have the votes to pass this discriminatory ordinance. While this campaign is far from over, the political winds have surely shifted. Englander, once defiant and sure of marginal support for the ordinance, has been reduced to polemic double-talk. This was in no doubt due to the power of the diverse coalition that united on behalf of fair housing in L.A.! Thanks to all of you who showed up to let your voice be heard! 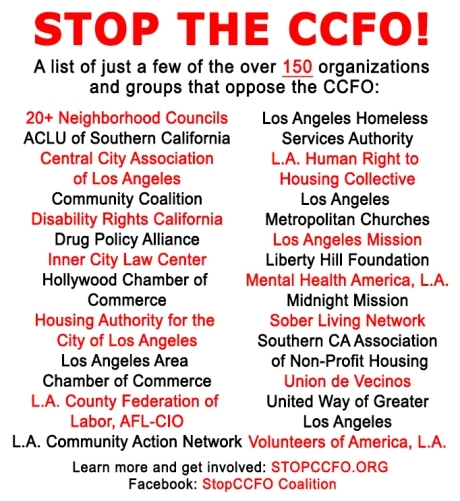 This entry was posted in Blog and tagged CCFO, Community Care Facilities Ordinance, Inner City Law Center, LA CAN, Los Angeles Community Action Network, Mitch Englander, Stop CCFO, United Way of Greater Los Angeles by eric. Bookmark the permalink.